^ Sagan, Carl (1961). “The Planet Venus”. Science. ^ Lodders, Katharina; Fegley, Bruce (1998). The planetary scientist's companion. Oxford University Press US. p. 190. ISBN 0195116941. ^ Read and Lewis 2004, p.16; Kargel 2004, pp. 185–6. ^ Faure & Mensing 2007, p. 252. ^ Kostama, V.-P.; Kreslavsky, M. A.; Head, J. W. (June 3, 2006). “Recent high-latitude icy mantle in the northern plains of Mars: Characteristics and ages of emplacement”. Geophysical Research Letters 33: L11201. doi:10.1029/2006GL025946. http://www.agu.org/pubs/crossref/2006/2006GL025946.shtml 2007年8月12日閲覧。. 'Martian high-latitude zones are covered with a smooth, layered ice-rich mantle'. ^ a b c 竹内薫 (2004). 火星地球化計画―火星探査とテラフォーミングの真実. 実業之日本社. ISBN 978-4408322353. ^ Zubrin, Robert (1999). Entering Space: Creating a Spacefaring Civilization. ^ Nozette, S.; Lichtenberg, C. L.; Spudis, P.; Bonner, R.; Ort, W.; Malaret, E.; Robinson, M.; Shoemaker, E. M. (1996). “The Clementine Bistatic Radar Experiment”. Science 274 (5292): 1495–1498. doi:10.1126/science.274.5292.1495. ISSN 0036-8075. ^ Brody, Dave (2005). 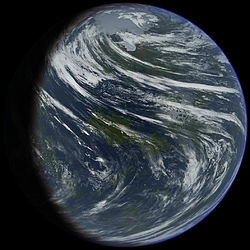 Terraforming: Human Destiny or Hubris?. Ad Astra (National Space Society). Spring 2005. Accessed 2009–06–09. ^ ScienceDaily (2001, Mar. 29). Jupiter Radiation Belts Harsher Than Expected.